PA-7000 Network Processing Card with 12x10GbE SFP+ and 2x40GbE QSFP+ interfaces, 4M sessions. Redefining high-performance network security, the PA-7000 Series of next-generation firewall appliances offers the perfect blend of power, intelligence and simplicity. Power, derived from a proven architecture, blends ultra-efficient software with nearly 700 function-specific processors for networking, security, content inspection and management. Its intelligence maximizes security-processing resource utilization and automatically scales as new computing power becomes available. The PA-7000 Series offers simplicity defined by a single-system approach to management and licensing. Identifies the application, regardless of port, encryption (SSL or SSH), or evasive technique employed. Uses the application, not the port, as the basis for all of your safe enablement policy decisions: allow, deny, schedule, inspect and apply traffic-shaping. Deploys consistent policies to local and remote users running on the Windows®, MacOS™, Linux®, Android®, or Apple® iOS platforms. Enables agentless integration with Microsoft® Active Directory® and Terminal Services, LDAP, Novell® eDirectory™ and Citrix®. Blocks a range of known threats, including exploits, malware and spyware, across all ports, regardless of common threat-evasion tactics employed. Limits the unauthorized transfer of files and sensitive data, and safely enables non-work-related web surfing. Identifies unknown malware, analyzes it based on hundreds of malicious behaviors, and then automatically creates and delivers protection. 1 Adding virtual systems to the base quantity requires a separately purchased license. 2 Network processing card with enhanced session capacity. The PA-7000 Series supports a wide range of networking features that enable you to more easily integrate our security features into your existing network. Network Processing Card (NPC): The NPC is dedicated to executing all packet-processing tasks including networking, traffic classification and threat prevention. Each NPC has up to 67 processing cores, all focused on the singular task of protecting your network at up to 20 Gbps per NPC. Scaling the throughput and capacity to the maximum 200 Gbps on the PA-7080 or 120 Gbps on the PA-7050 is as easy as adding a new NPC and allowing the system to determine the best use of the newly added processing power. Addressing the increasing demand for higher density 10 Gig and 40 Gig connectivity, as well as the more common 10 Gbps and 1 Gbps interface alternatives, four NPC options are available and can be used interchangeably. Switch Management Card (SMC): Acting as the control center of the PA-7000 Series, the SMC intelligently oversees all traffic and executes all management functions, using a combination of three elements: the First Packet Processor, a high-speed backplane, and the management subsystem. First Packet Processor (FPP) is the key to maximizing performance and delivering linear scalability to the PA- 7000 Series. The FPP constantly tracks the shared pool of available processing and I/O resources across all NPCs, intelligently directing inbound traffic to any underutilized processing. This means that, as NPCs are added to increase performance and capacity, no traffic management changes are required, nor is it necessary to re-cable or reconfigure your PA-7000 Series. Management subsystem acts as a dedicated point of contact for controlling all aspects of the PA-7000 Series. Log Processing Card (LPC): The LPC is a dedicated subsystem designed to perform the critical task of managing the high volume of logs generated by the PA-7000 Series. The LPC is unique to the PA-7000 Series and uses two high-speed, multi-core processors and 2 TB of RAID 1 storage to offload the logging-related activities without impacting the processing required for other management or traffic processing-related tasks. The LPC enables you to generate on-system queries and reports from the most recent logs collected or forward them to a syslog server for archiving or additional analysis. The PA-7000 Series is managed as a single, unified system, which enables you to easily direct all of the available resources to the singular task of protecting your data. The controlling element of the PA-7000 Series is an ultra-efficient, single-pass classification engine that analyzes all traffic traversing the appliance to immediately determine three critical elements that become the heart of your security policy: the application identity, regardless of port; the content, malicious or otherwise; and the user identity. The benefits of determining the application, content and user in a single pass, and basing your security policy on those business relevant elements, are threefold. The first is an improvement in your security posture introduced by more directly mapping your security policies to key business initiatives. The second is a reduction in the administrative overhead associated with keeping security policies current in a highly dynamic environment. The third benefit is a reduction in latency brought on by the elimination of the redundant scanning and look-up tasks commonly found in alternative offerings. To help further simplify administrative effort, annual support and subscription fees for the PA-7000 Series are system-wide, which means that, no matter how many NPCs are installed, the annual fees are constant, providing you with a predictable, annual cost structure. Mean time between failure (MTBF) Configuration dependent; contact your Palo Alto Networks representative for MTBF details. 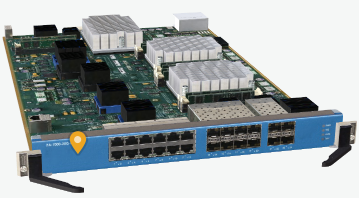 1 Network processing card supporting enhanced session table capacity up to 8 million sessions. Download the Palo Alto Networks PA-7000 Series Specification Datasheet (PDF).